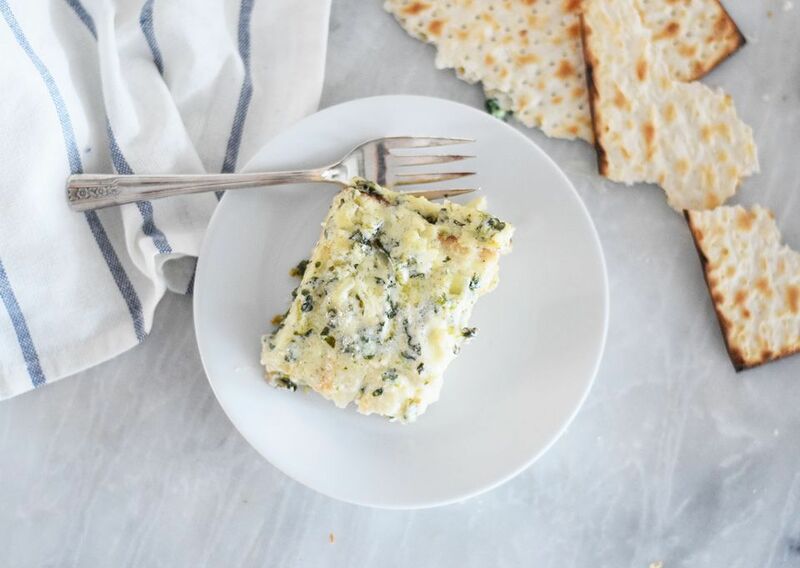 Are you looking for Passover-friendly recipes that omit leavened grains or searching for interesting ways to use matzo left over from the holidays? With these tasty ideas, you don't have to be Jewish or celebrating Passover to enjoy matzo for every meal of the day—from breakfast and lunch all the way to dessert. This genius recipe for a three-cheese vegetable lasagna looks and tastes like the classic kind, but is Passover-friendly, thanks to matzo squares that take the place of pasta sheets. Make it ahead and freeze in portions for filling last-minute weeknight dinners. Do you miss the ease and crunch of breakfast cereal during Passover? Pour yourself a bowlful of this matzo granola and top with milk for an everyday meal. It gets plenty of nutrition and flavor from matzo farfel, coconut flakes, almonds, raisins, cinnamon, vanilla, and maple syrup. Matzo ball soup is a warming Jewish comfort food that is a must-have at Passover seders. This genius recipe features an intensely-flavored chicken broth that tastes like you spent all day in the kitchen, but cooks easily with chicken thighs in the Instant Pot. The classic, pillowy matzo meal dumplings are just like the ones mom makes. Popular deli breakfast ingredients combine with a classic Passover morning treat in this delicious scramble featuring smoked salmon, egg, leafy greens, and fried matzo. Serve it when guests drop by for brunch during the holiday. Crispy, breaded chicken breasts baked to juicy perfection are yours to enjoy during Passover when you use matzo meal to form the crunchy exterior. Add some poultry seasoning to the coating mixture for an extra punch of flavor. Kugel is a baked noodle casserole that's an essential side dish at Passover dinners. This healthy variation uses spiralized zucchini noodles (aka "zoodles") instead of pasta with a crunchy herbed topping made from crushed matzo crackers. Kid-friendly baked macaroni and cheese makes a great Passover family meal. Matzo farfel (or crushed up matzo pieces) replace the usual wheat noodles in this rich and creamy dinner that includes sour cream and plenty of cheddar cheese. 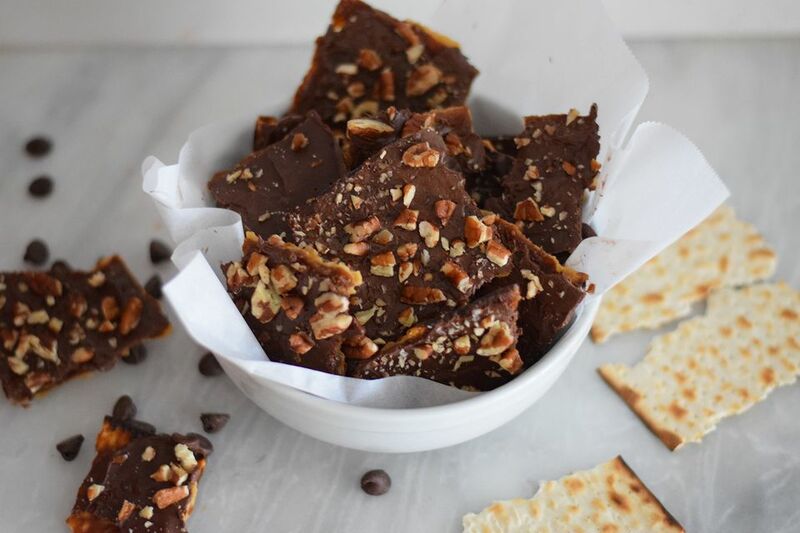 Lightly-salted matzo pieces are loaded up with sticky homemade toffee, melted chocolate, and chopped pecans to create this divine Passover holiday bark. It's great for snacking or gifting to friends and family. The recipe includes great tips for variations. You may think pancakes are off limits during Passover, but this smart breakfast recipe puts them back on the menu! Matzo cake meal and tapioca starch give these golden-brown flapjacks a satisfying texture. Drizzle with warm maple syrup for serving. Latkes are fried pancakes typically enjoyed at Jewish holiday meals. While potatoes and flour usually form the batter, this health-conscious recipe uses cauliflower and matzo meal for a lighter and healthier appetizer. Serve them hot with sour cream and applesauce for dipping. Vegan and vegetarian Seder guests can enjoy homemade kugel with this recipe that combines sweet potatoes, apples, raisins, matzo meal, cinnamon, and nutmeg. Add optional walnuts for extra crunch. Sponge cake studded with ripe mashed bananas and chopped walnuts makes a light and elegant dessert at lunch, dinner, or afternoon tea. This recipe uses matzo cake meal and potato starch in the batter, so it's guilt-free for Passover. Mandel bread is the Jewish version of almond biscotti cookies and is wonderful to enjoy (and dip) with your afternoon coffee or tea. This traditional recipe can be enjoyed simply, or dressed up with your favorite chopped nuts, dried fruits, or chocolate chips. If you like Skor bars, you'll enjoy this holiday-friendly spin, which combines the flavors of homemade caramel and chocolate with the crunch of matzo. It makes a popular Passover dessert or a special lunchbox treat for kids.